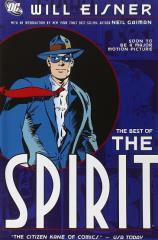 DC Comics is proud to present its first-ever collection celebrating the greatest stories by comics mastermind Will Eisner starring one of the most indelible characters ever created: The Spirit! The Best of The Spirit reprints 22 Spirit sections from 1940-1950, featuring famous first appearances, classic confrontations, human interest tales, and all those magnificent splash pages! Eisner's blue-suit-clad, fedora-wearing crimefighter starred in hundreds of newspaper adventure stories that thrilled readers with Eisner's groundbreaking style. Eisner was a master of utilizing the comics format to its greatest strengths, and his Spirit stories are some of his finest examples!